Minimally invasive heart surgery has many benefits, including shorter recovery time and improved overall health, but the most cited result is typically the cosmetic one. Minimally invasive heart surgery is sometimes called “scarless heart surgery,” because of the nearly invisible scar that results from it. Cardiac patients now have more than one choice when it comes to the treatment for heart conditions and their cosmetic results. Many people are familiar with traditional heart surgery scar. The long 8″ to 12″ incision leaves an unsightly scar, as shown in the graphic to the right. The large scar can be hard to hide with a lower cut or flimsy shirts. In some cases, the gash is the source of confidence issues and it becomes an overall nuisance. If you are researching heart surgery options, and do not want to have a ghastly mark on your body as the one shown, continue reading. 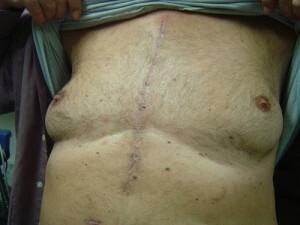 The “scarless” heart surgery cosmetic result is shown on the left. Patients can expect a 2″ incision along the skin crease underneath the breast. When fully healed, the scar will turn into a thin white line that is barely visible. This tiny line can be hidden easily under low cut shirts, evening gowns, and the flimsiest of apparel. For female cardiac patients, the scar is usually hidden under the fold of the breast. This is very similar to the technique used by cosmetic surgeons for breast implant placement. See one of our female patients below. The first picture is a good demonstration of the superior cosmetic results we can achieve in comparison to a traditional median sternotomy. There are obviously no visible scars. The second picture shows how very minimal the scar can be. If you’re interested in learning more about the overall and cosmetic results of minimally invasive heart surgery, contact us today. Call now at (330) 363-1341 or fill out our online contact form.